The G-Force SmokeDriver will be delivered with a default configuration. 50% pump output for center smoke. You can change the parameter via the transmiter of an RC-System. Easier and more comfortable, you can use our Smoke-Systems Terminal. and connect your smartphone with the BlueCom. please use the BlueCom Adapter (IOS). 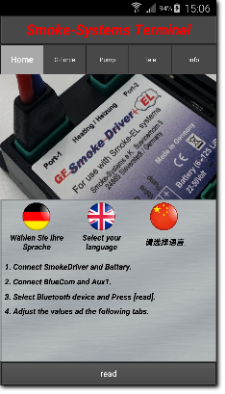 Once the connection between the app and the GF-SmokeDriver is established simply adjust the parameters to your liking. There is no manual available and not needed. The screenshots show the app’s user interface. 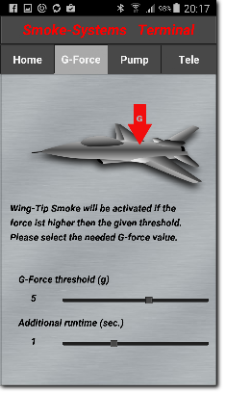 the app automatically change in the tab [G-Force]. the delay time can be set. The setting is done simply by dragging the sliders. The values are transferred immediately to the Smoke Driver. 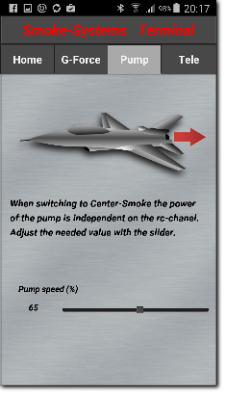 for the Center Smoke can be set . Values 25 - 100% are possible. 100% corresponds to 600ml per minute. For Apple devices, see the Terminal application on the App Store.